I can't believe how fast time flies. Is Christmas really coming in less than a week? London is currently covered in fresh snow that causes more traffic problems but makes this city look so beautiful. I hope we will get to Prague for Christmas. Last year we spent 8 hours waiting at the airport for a 1.5 hour flight (the story was a bit more complicated but I won't bore you with details). I can't wait to see my family and friends, eat christmas cookies, watch my favourite TV fairytales and relax. 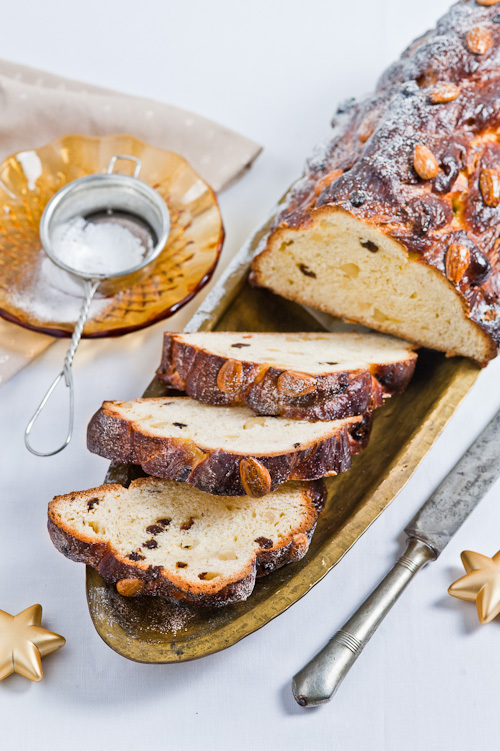 Sweet Christmas bread is same as Christmas cookies an essential part of Czech Christmas. My mum makes the best sweet Christmas bread ever. 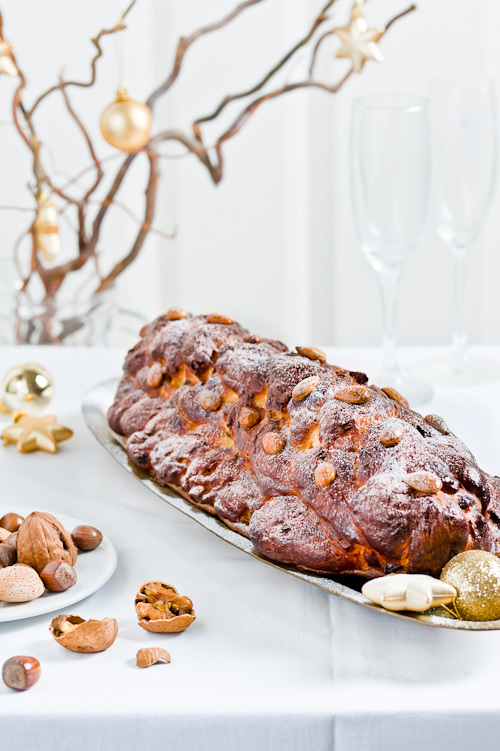 I shared my sweet Christmas bread recipe in the special Christmas issue of G2Kitchen magazine. 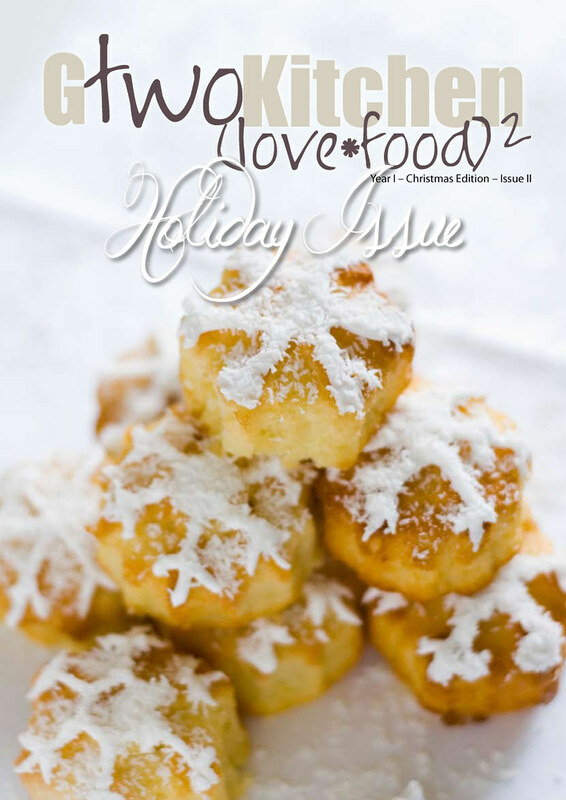 This issue is filled with festive recipes from all over the world. In a small bowl, combine the yeast, 1 tablespoon of sugar and half of the warm milk and whisk thoroughly. Leave in a warm place until the surface is covered with approx. 2cm of froth (10-15 minutes). In a mixing bowl beat butter until soft and smooth. Add the sugar, egg yolks, salt, lemon zest and vanilla and beat until well combined and thick (about 10minutes). Sift flour into a large bowl, make well in center and pour in the yeast mixture. Add rest of the milk and the butter mixture and mix until a dough forms. Transfer to work surface and start kneading the dough. Dough will be slightly sticky but the more you knead it will become uniform. If it's too sticky add a little flour and knead until smooth and elastic. Finally stir in the raisins, almonds and grated nutmeg. Place the dough in an oiled bowl, cover with a towel and let it rise in a warm place for 1 hour or until doubled in size. When the dough has fully risen, transfer it to work surface and divide into 9 parts. Roll each part into an evenly thick rope. To braid, line up the 4 ropes, pinch their tops together and start braiding. Take the left rope and lay it over the one to the right, then under the next one, and over the rightmost one. Repeat with the rope that is now the leftmost one. Repeat until you are at the end. Pinch the end together and place on a baking sheet lined with parchment paper. Take the next three ropes, pinch their ends together and braid. Pinch the bottom ends together and place the braid on top of the four-strand braid. Tuck the both ends under the bottom braid. Make a two-strand braid of the last two ropes and place on top of the other two braids, tucking the ends under. Secure the braids in place by a few tooth sticks. Cover with a towel and let rise for about 20 minutes. Brush the surface with beaten egg and dot with almonds. Let the egg wash dry, and brush again. Bake in preheated oven to 190C for about 10 minutes. Reduce the temperature to 170-180C and bake until the surface is golden-brown for about more 30-40 minutes. If the surface is getting too dark during baking but the center isn't done yet, cover the bread with aluminium foil. Let it cool slightly, then remove the tooth sticks.